Our state fair is a great state fair. Don't miss it, don't even be late! I haven't been back to the fair for years, in part because I lived out of state for so long. 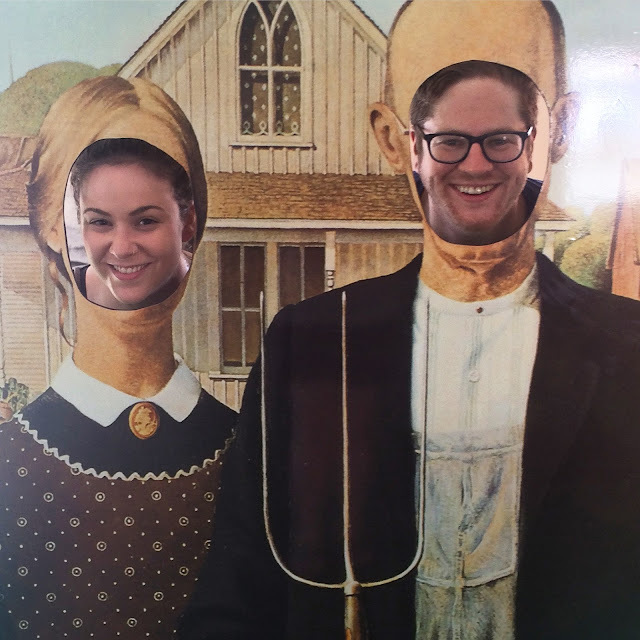 I wanted to go last summer, but my move to Cleveland made the timing impossible, so this year, I told Mike that the only thing I wanted for my 32nd birthday was a day at the Ohio State Fair. And so it was. We drove down to Columbus after work on Friday & spent the night in a great AirBnB in the Short North. The hostess even left us a sign that read "Happy birthday, Kate!" We had dinner at Crest Gastropub & watched the Olympics opening ceremony from Bier Stube, a dive bar recommended by our broey Uber driver. And early the next morning, we set off for the fair. The Ohio State Fair is one of those places where time stands still, where everything is as it always has been. The faces are different & the technology is better, but so much is exactly as it ever was. As we walked the fairgrounds, I told stories & pointed out familiar places & sought out my favorite food stands, nearly all of which were just where I'd remembered them being. 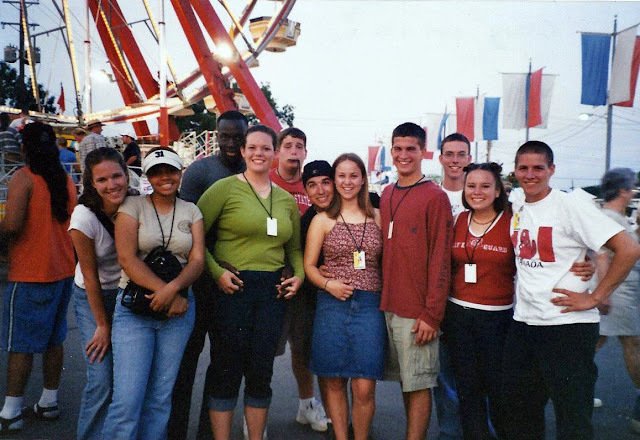 The first summer I was in the choir, my friend Kari & I ate a corndog every day for two weeks, as only 15-year-olds can. There are plenty of corndog stands throughout the fairgrounds, but to my shock, the famously cheap corndog stand next to the big slide is still there, right next to the big slide! The price has gone up for $1 to $2, but hey, that's inflation for ya. After 15 years, I'm actually surprised they still cost so little. I didn't buy one last weekend, but I was still really excited about this discovery. Why no corndog? 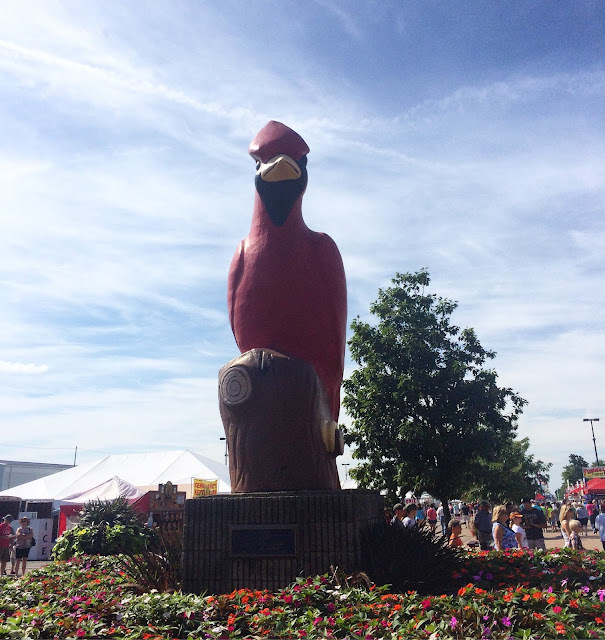 There are more than 200 food vendors at the fair, & I wanted to try it all! We were starving when we arrived, & unfortunately, I couldn't remember the way to the breakfast stand where I used to grab bacon & cheese sandwiches on my way to choir practice. Instead, Mike bought biscuits & gravy from the Der Dutchman stand, an Amish restaurant, & I got cheese on a stick from a standard carnie kiosk. That's sorrrrt of like a breakfast sandwich, right?! Off to a delicious start. Of course, everyone knows that state fairs, especially in the Midwest, are known for their copious amounts of fried food - & it's true, the Ohio State Fair is chock full of it. At one stand, you could get deep-friend anything, basically, including entire PB&J sandwiches & balls of cream cheese stuffed with crickets. Yeah, you heard me. Look at this crazy list! What you don't hear quite as much about is all the meat. First, there's an indoor (air conditioned!) building that houses the Taste of Ohio Café, which serves only Ohio-grown foods. All the watermelon is from Ohio farms, all the hamburgers are from the Ohio Cattlemen’s Association, & so on. The meal options are broken down based on types of meat: the pork stand, a beer stand, a lamb stand... And outside, there are massive, block-long food stands that serve nothing but grilled meats, of every shape & variety. Dairy products are a main feature of the Ohio State Fair, which is famous for its annual Butter Cow. The Butter Cow, which has been carved each year since 1903, is the size of a real cow, & its accompanied by a life-sized baby calf. They take more than 500 hours to carve. And each year, some other butter statue goes up, too; in past years, it's been Darth Vader, astronaut Neil Armstrong, Wendy's icon Dave Thomas, & Brutus of the OSU Buckeyes. No surprise: This year's bonus butter feature was a tribute to the Cavs! While we were visiting the Dairy Barn, we bought strawberry milkshakes made fresh with milk from Ohio dairy cows. It was thick, creamy, & flavorful, one of the best milkshakes I've ever had, but as soon as I finished it, my stomach started roiling & I felt compelled to quote Anchorman: "Milk was a bad choice," at least on such a hot, sunny day. Woof. The fair is also full of show animals that are on display throughout the fair. We spent a lot of time admiring the rabbits, & a handler even let me pet one of them, although it seemed terrified. I didn't get any pictures of them, but my favorite kind of rabbits are the ones that are so fluffy they look more like mopheads than bunnies. I also cooed at the baby cows. Two of them were born just the day before! So wobbly. But I passed on milking the mama cows, as I have a distinct memory of wanting to vomit at the texture of their udders circa 2001. And how 'bout these massive pumpkins? One of them weighed more than 300 lbs.! This display was, quite brilliantly, sponsored by a company that makes industrial strength scales. How genius is that? That's product placement done right, folks. We spent a significant chunk of the day in the Ohio Department of Natural Resources park, a large, wooded section of the fairgrounds dedicated to showcasing Ohio's slice of the great outdoors. It includes a large, talking Smoky the Bear statue, & much of it is set up like an outdoor museum, with explanations of the flora & fauna you'll find throughout the state. There's also a large hands-on space, where fairgoers can try their hand at fishing, kayaking, archery, & shooting. The park also includes an aviary, where we saw three kinds of owls, two bald eagles, a peregrine falcon, & a blue herron, all rescues that spend the rest of the year in rehab facilities. "Do you think bald eagles have any idea just how American they are?" Mike mused. One of the best parts of the day, for both of us, was visiting an entire garden full of butterflies! There were four types in there, & after awhile, we finally spotted all of them. "Real-life Pokémon Go," Mike joked. We spent probably 20 minutes just staring at butterflies. For me, a highlight of the day was watching the choir sing at the ODNR Stage, an outdoor amphitheater in the park section. It was their last day of performances, so it was way more casual than usual - think staff jumping into the moat around the stage mid-song - but it was still great to hear the choir. So many memories! And when they reached the last three songs, alums were invited to join in. I haven't sung "professionally" in ages, & I was pleased to find that I still remembered the words - & most of the right notes. One section of the fairgrounds that we didn't really make it into was the area full of rides & games. We wandered through for the people-watching (SO GOOD), but that was about it. Mike doesn't love heights, so the Ferris wheel was off the list, & the line was much too long for the sky glider. We drank four bottles of water apiece throughout the very hot day, but when we wanted something a little different, we bought lemon shakeups, a fair favorite. The shakeup stand used to be right near the ODNR park, & after shows, all the choir members would sprint out to beat one another to the line. It's since moved to a better location, but they taste just as I remembered! Of course, there are a few things we didn't try, like that whole table full of smoked meats & whatever the hell this is. Actually, I don't think I want to know. We did, however, end the day my splitting an order fried Oreos. They don't look like much, but let me assure you: They tasted incredible. I had to throw away the last two so we didn't overindulge, & even then, we felt pretty darn gross afterward, but, like, how often am I eating fried Oreos, right? Gotta live a little. Sorry, arteries. At the end of the day, I left full & happy & hardly sunburned, thrilled to have finally returned to this place that has always brought me so much joy. It's such a weird event, but it's also just so wonderful. Have I mentioned lately that I love this state? Thanks for a great 32nd birthday, Ohio.